Blow Type : Wide area, medium thrust, low penetration, high volume. Air Amplification : 7 - 12 times the compressed air consumed. Available attachments and accessories : Crevice nozzle, extension tubes to reach difficult to access area. 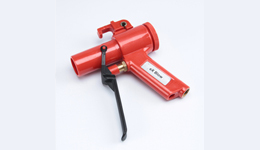 New eX Blow Gun is fitted with suspending hook and convinient levered trigger. Applications : High volume air blow, substitute for electric blower using compressed air blower, wide area blowing off, dunnage bag inflator, filling of dunnage bags.